A presentation given in October 2008 at an international conference in Frankfurt for professionals working with Holocaust survivors. Those who attended the conference in Vienna in 2007 know how strongly I feel about helping survivors to maximise the time they have left in their lives and to ensure that they end their lives with peace and dignity. The first part of my presentation will look at services that we have developed, and continue to develop, to make the last part of life as positive and comfortable as possible for survivors. These services include the practical responses which are both concrete and tangible. Obviously, when someone is starving and cold we must ensure that they are fed and given warmth. The second part of my presentation will draw attention to the equally important subject of the emotional issues facing survivors as they age, and how we help them to plan for the end of their lives. I will make particular reference to the spiritual dimension and the care of the soul. I will then move beyond the present to the future and suggest ways that we can plan with survivors for the time when they are no longer with us. I will refer to as this as the transmission on their legacy. I believe the survivors’ legacy has fundamental importance, not only for the survivors and their families, but for the Jewish community as a whole. Let me begin by asking the question, what does the end of life mean? As I was preparing this presentation, I received phone calls from two survivors I have been working with for more than 20 years. One telephoned to tell me that she had been admitted to hospital with heart problems, and the other was experiencing pain and fear connected to the cancer that had returned for the fifth time. Both felt they had little time left. As the frequency of death increases in my work, it would be so easy for me to be drawn into a vortex of despair and hopelessness. It is certainly difficult to watch the health of these two people deteriorate, but at the same time, I have had the opportunity to get to know them over many years. This puts their current difficulties into a framework. I have listened to them and learned from them about what helps them to live with the aftermath of their trauma, how to make the most of their lives and how to prepare for the inevitable end. My work has included giving them the space to share their traumatic memories with me in a nurturing relationship, involving their families, acting as an advocate for them with the medical profession or sometimes going with them to the hospital, helping them with practical matters, or just being with them informally in the Holocaust Survivors’ Centre, and perhaps sharing a joke with them. The survivors inspire me to view natural death in a positive light, in contrast to their past experience of death by murder of their close family and friends in the Shoah. I have come to believe that it is never too late to make a positive impact on people’s lives, even when we know we are working against time. From this point of view the “end” should be understood as living positively to the end, and not only addressing death and dying. Survivors themselves often say that it is a miracle that they have lived to such advanced ages – it was certainly not Hitler’s intention. Many celebrate the fact that their children and grandchildren are replenishing the Jewish world that was almost lost. On the whole, the survivors who use our services take meticulous care of their appearance, and defy many of the stereotypes of older people. Yet we should not be lulled into a state of complacency by this coping strategy, as it may also mask the reality of their increasing frailty. 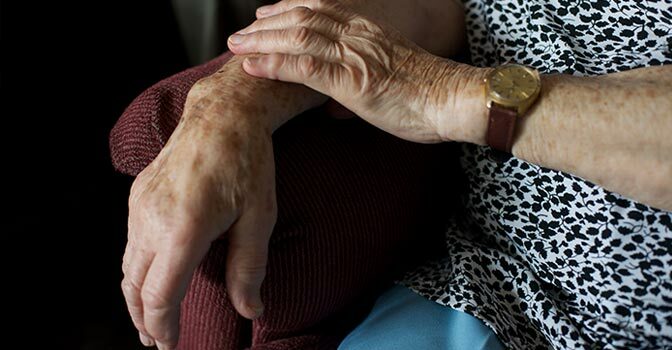 Many are reluctant to ask for help from professionals, as the associated powerlessness may be linked to past memories of extermination of vulnerable groups such as the elderly. Against the backdrop of the survivors’ traumatic past, we need to be sensitive to the complexity of the survivors’ relationship to aging. With more time on their hands after retirement or when their families have left home, the traumatic memories that had lain dormant came to the surface. Many survivors have no model of aging, as their parents and older relatives were murdered. Ill health and losing control over their faculties, both physical and mental, can bring back fears of once again being at the mercy of their oppressors. These fears are compounded by the reality of how older people in society are generally regarded. They are often ignored, made silent and marginalised. So what does this mean when we try to respond to the practical needs of aging survivors? Firstly, we need to counteract their fears of vulnerability and dependency by empowering them to maintain their independence at home as long as they possibly can. From my experience this is usually their preferred choice. Entering residential care or any institution, however benevolent, is anathema to many survivors. It can bring back memories of earlier incarceration. Those who were victims need to feel that they are in the driving seat in terms of decisions about their lives. The freedom to choose, which was denied them in the Holocaust, is therefore an essential therapeutic principle when working with survivors. We need to offer them viable options to choose from that help them stay in their own homes as long as they wish. These may include financial assistance, domiciliary support, home adaptations, alternative housing and day care. I am sure you all know about these practical services that can be provided through statutory or voluntary agencies. This will of course vary from country to country. I believe that it is the context in which these services are provided that has, in my experience, made its most profound impact on the lives of survivors. In my work that context has evolved into an integrated specialist therapeutic model, namely, a social centre (Holocaust Survivors’ Centre) situated next door to a multidisciplinary team of counsellors, social workers and creative therapists (Shalvata). I will now look at that model in more detail. The Holocaust Survivors’ Centre is specific to Jewish survivors and their spouses, and its social programme is tailored to their particular needs. It is the Centre’s specificity that offers survivors a sense of belonging with others who have suffered, and gives it its meaning. The fundamental therapeutic principle on which the Holocaust Survivors’ Centre is founded is that of offering mutual support groups to those who have suffered severe trauma. This response has widespread relevance to all work with war trauma and the effects of displacement. It forms the bedrock of my work with a group of refugees from the former Yugoslavia. Holocaust survivors often live with memories of abandonment and isolation from the world during the Shoah. In the depths of their suffering, being part of a pair or a group could make a difference to living one more day. It was difficult to survive alone. By bringing survivors together in the Holocaust Survivors’ Centre we have translated that coping strategy from the past into our specialist service today. Our therapeutic aim is to ensure that those who suffered at the hands of the Nazis should never again experience the horror of being victims. How do we do this? Primarily by empowering survivors, working in partnership with them as members of the Centre, and actively involving them in its development. The elected Advisory Committee has become the Centre’s think tank. We regularly meet with the nine committee members to ensure that the services meet the survivors’ needs. I have learned that regular consultation, both formal and informal, is the key to building up trust with people whose trust was shattered in the Shoah. It is not the easiest way to manage a service but it is essential to do so in the light of the survivors’ past experiences. The Holocaust Survivors’ Centre is open six days a week. It offers survivors a nourishing meal as well as social programming to keeping survivors’ bodies and minds active. The aim of the programme is to offer relief from past horrific memories and connect survivors to positive thoughts. A daily thick soup served in the café helps to counteract past memories of the watery starvation rations in the death camps. I have learned that when survivors are able to share food with fellow survivors it is a far more therapeutic experience to eating alone. It follows that a careful assessment needs to be done before delivering meals on wheels that takes account of the emotional as well as the physical needs of the survivors. The weekly Yiddish group at the Centre helps to link survivors to positive memories of home and their childhood before the Holocaust began. The programme is a celebration of survival and their enjoyment of the activities can be seen as a victory over their Nazi oppressors. Sensitivity to the importance of this outcome to survivors would be difficult to achieve in a generalised day centre for the elderly. One of the most significant strengths of the Holocaust Survivors’ Centre has been its success in helping survivors to rebuild a community. Many talk of the loss of their communities as the greatest loss of the Holocaust. The survivors call the Centre their home, their lifeline and a place where they belong. They named the facility the Holocaust Survivors’ Centre, and feel it has given them back their identity which was taken away from them in the Shoah. As the survivors grow frail, many come to the Centre three to four times a week. The Centre allows us the opportunity to monitor how survivors are coping with everyday tasks, and to alert us to any deterioration. With Shalvata integrated into the work of the Holocaust Survivors’ Centre, referrals to social workers and counsellors can be made immediately and thereby help in preventing crises. We now employ a care worker for frail survivors and those with dementia. Some survivors who have had to go into residential care wish to continue to meet with fellow survivors at the Centre. It is very moving to hear those who can hardly walk breathe a sigh of relief when they come through the doors of the Centre, and say how glad they are to be there. In the future, fewer survivors will be able to make the journey to the Centre and we may have to increase locally based social outreach groups. Home visiting will also need to be significantly increased by Shalvata’s specialist workers and our volunteers. Until that happens, we will continue to keep the HSC vibrant and very much alive as the survivors’ needs increase. In preparation for the last part of the survivors’ lives, we have worked with survivors to develop a housing project. They have their own purpose-built flat that promotes independence, but 24-hour care support is available when needed. The principle behind the new scheme is similar to our specialist day care service, namely, to keep survivors together in a mutually supportive community in which they have a say in how the service is run. These specialist services for survivors play a major part in meeting their physical and emotional needs as they age, as well as being cost effective. They also offer relief to survivors’ families from the worry of having to care for their frail parents alone. I would strongly urge that similar services are developed worldwide, if that has not already happened. Without the HSC next door to Shalvata, I believe that it would be much more difficult to provide an adequate service to survivors as they face the last part of their lives. I realised through my work in Shalvata that there was no cure for the deep wounds that lay just below the survivors’ emotional skin. To help survivors to live with their trauma, we needed to balance their negative memories with positive ones in order to lift their emotional mood. That is the beauty of having these two centres interwoven into one therapeutic whole. By the same token, the Holocaust Survivors’ Centre’s therapeutic impact is greatly enhanced through Shalvata’s ongoing presence and the individual and group work it offers. Shalvata offers opportunities to survivors, if they choose to do so, to speak about their traumatic memories, to be listened to and to be believed. One Auschwitz survivor said that it had helped him “to get rid of the poison” that was still inside him. We have trained volunteers to record the survivors’ eyewitness accounts. We have also offered training for survivors to speak publicly about their experiences to schoolchildren and other groups. The positive feedback they get is extremely therapeutic. However, speaking about the trauma is only for those who feel they can or wish to do so. For many it’s just too difficult to find the words to express the inexpressible. The specialist workers in Shalvata need to be flexible, adaptable, sensitive and creative in their approach in order to reach out to those who find it hard to ask for help. As well as seeing survivors individually or in groups at Shalvata, the professionals may also facilitate groups in the Holocaust Survivors’ Centre, or accompany survivors on outings. For example, Shalvata’s art therapist facilitates the Hebrew singing group in the HSC, and one of the counsellors from Shalvata supports the Solo group in the HSC for members who are alone in life. My view is that the only useful therapy is the one in which the person asking for help feels helped. I had to unlearn and adapt many of my traditional therapeutic practices to make them user-friendly to survivors. For example, I needed to build more equal, and sometimes informal relationships with survivors, and encourage them to teach me about what helps them. Terms such as assessment and boundaries had to be redefined in light of the survivors’ traumatic past. Details of how I developed and adapted my therapeutic responses can be found in my book A House Next Door to Trauma – Learning from Holocaust Survivors how to respond to Atrocity. My urgent task in this presentation is to focus on the present and future. As increasing numbers of survivors are dying, this impacts on the survivor community as a whole as well as on professional staff and volunteers. The more fluid professional boundaries, which proved so essential in building therapeutic relationships with survivors, has meant that there are fewer buffers to protect professionals as survivors get closer to the end of their lives. There is a tendency for professionals to feel more emotionally exposed when survivors die. The challenge for professionals is being able to remain close to survivors without withdrawing or burning out. Finding the spiritual dimension our work can help us to do this. I will look at this in more detail. The other way is through ensuring the survivors’ legacy will live on into the future. Both these key factors help to breathe new life into our work at a time when the end of life is so evident. Let me look at spirituality first. Some professionals may question what spirituality has to do with their everyday work with survivors. Those who are used to offering practical or medical help to people in the latter part of their lives may feel it is an alien subject and it should be left to others trained in spiritual matters. There are, in fact, many myths surrounding the subject which I hope to dispel. Let me begin by defining what spirituality is. Spirituality is a component in everyone’s lives, yet it is often confused with religious practice. It is concerned with the care of the soul rather than material matters. Valuing people and celebrating their lives has as much to do with spirituality as the ritual surrounding dying and death. We get closer to people’s spirituality and our own when we uphold the principle of preserving their human rights by relating to them with dignity and respect. That being so, it is easy to see how this connects to our work in the caring professions. It could be argued that is what we do anyway, yet the word spirituality is rarely part of our common professional language, and it certainly was not taught when I trained as a social worker. The spiritual dimension for me allows me to practice the Jewish ethic of helping the stranger, which includes my work with Bosnian refugees. It allows me through the Centre to preserve Jewish ritual and observance that contribute to the continuity of the Jewish world. It helps me to fuse together into one entity my professional and personal backgrounds with my Jewish identity. Though others may not see their work as I do, we still need to ask ourselves questions about what draws us towards working in a particular profession, in a particular organisation, or with a particular group of people. We are all governed by our own beliefs and value systems, whatever our religion or culture. These may enhance or interfere with our understanding of those we are trying to help. We need to become familiar with our own beliefs, or lack of them, before we can engage with the spiritual dimension in others. We need to focus, for example, on our views of life after death, on cremation versus burial, or on issues that relate to prolonging life at all costs. What is important is to be open to the presence of the spiritual dimension and to be aware of it. There is no blueprint for engaging spirituality in our work that would hold true for each individual, each resource or even each country. I can only speak from my experience. I see the survivors as the precious links in the chain between the communities annihilated by the Nazis and the Jewish community today. Offering to connect or reconnect them to their Jewish roots I believe to be an integral part of our work in alleviating suffering alongside our familiar practices. It is the focus on Jewish continuity in my work which gives it its meaning and its spiritual foundation. I would now like to illustrate these rather esoteric concepts by looking at some examples of how the spiritual dimension pervades what I do. The spiritual dimension emerged in the moments in Shalvata when I was listening to survivors’ accounts of atrocity. Absorbing the survivor’s pain while at the same time searching for hope with them brought me closer to my inner self and my beliefs. It is in the challenge, or perhaps when you feel the odds are against you, that you touch upon something deep inside you that guides you to act in certain ways. In most situations, I have found, there is usually something that can be done to alleviate suffering and promote well-being, but sometimes we have to fight for it. For example, it can be seen in my fight for the establishment of the HSC at a time of economic recession. From listening to survivors I knew what they needed, and I was in the right place at the right time to do something about it. We are now at the eleventh hour in our work with survivors, and we need to focus on what still needs to be done. We need to be open to hearing their anxieties that may only be picked up in whispers. For example, some survivors have not been practicing their Judaism yet want to be buried as Jews, particularly if their families were denied this by the Nazis. More specifically, we may discuss the possibility of putting the names of their murdered family members on their own tombstone. I would like to give an example of a child survivor I have worked with over many years. Her mother was murdered in the death camp Auschwitz-Birkenau, and therefore did not have a Jewish burial. As the survivor’s sister was buried in a Jewish cemetery in London, I helped her to choose a new tombstone that would include her sister’s and her mother’s names. A rabbinical colleague accompanied us to the cemetery and he recited Kaddish. The survivor felt that her mother’s soul had found a resting place and the spiritual work that had been left undone had now been completed. Why did I feel I needed to remain involved rather than referring the matter on to the rabbi? Firstly, I have known this survivor for many years and it seemed natural to be there with her. Secondly, many who went through the Holocaust have a drastically reduced network of family support, so those of us who work with them are often seen as part of their replacement family. Thirdly, it mattered to me that her murdered mother should be at peace. In turn, I hoped that the survivor herself would find some relief from the emotional burden of carrying her mother on her back. Some survivors want to join a Jewish community. Others may be concerned that the correct ritual will be performed to care for their body prior to burial. Being open to talking about these issues with those we care for may help to ease their minds. Our work continues even after death when we attend funerals of members, taking their fellow survivors with us, as well as visiting their families at the shiva. These mitzvot (good deeds), which we are commanded by Judaism to perform, are integrated into our everyday work, and help give it its spiritual focus. Through attending a Jewish Centre survivors can connect to their Jewish identity without having to be Orthodox. By keeping kashrut at the Centre or participating in the celebrations of the Jewish festivals or Friday night dinners, something that may have become unfamiliar may enter their lives again and warm the soul in preparation for letting go of life. Jewish rituals and practices are only part of the equation in the spiritual dimension. The other crucial aspect relates to giving older people a sense that they will not be forgotten when they die. If they are not remembered it is as though they never existed. The Talmud says that we all die twice, once when we stop breathing and once when we are forgotten. As survivors near the end of life, we need to devote time to getting to know from them how they want to be remembered. This is what I referred to earlier as their legacy. Remembering has been a major raison d’etre in survivors’ lives, whether through their testimonies, their participation in Holocaust education, or in writing books or speaking to the media. In the U.K. we now have a national Holocaust Memorial Day, the Holocaust is part of the national curriculum, and there are museums devoted to the Holocaust. Despite this, survivors still fear that their memories will be watered down and the particularity of their suffering will be ultimately forgotten. I believe these fears are not unfounded and are all the more worrying at a time of economic recession and rising anti-Semitism. Their fears make it more difficult for them to let go of life peacefully. Survivors’ concerns about the transmission of their legacy are compounded by the fact that many of the second and third generation, whom they hoped would keep their memories alive, find it too difficult to do so. My view is that the relatives of survivors should not have to carry this task of remembrance alone. It needs to be shared with the whole Jewish community. This may help the survivors’ children and grandchildren to feel less isolated and burdened by their family’s trauma. The importance of ensuring the transmission of memory is all the more vital for those survivors who develop Alzheimer’s disease. They tend to lose control over what can and cannot be remembered. I believe that those who work with survivors, or others who are close to them, are entrusted to keep them connected to who they were, to preserve their integrity and to keep them whole when they can no longer do this for themselves. If memory resides in the soul, then keeping these fragmented parts of the mind together helps to keep the soul intact in preparation for the end of life or, if you believe in it, for the world to come. As the Talmud says, “Respect the old man who has forgotten what he learned. For broken tablets have a place in the Ark besides the Tablets of Law.” Working with survivors at the end of their lives means we have to develop practical ways of ensuring that the links in the chain between the past, the present and the future are not severed. How do we do this? By making personal connections between individual members of the Jewish community, particularly young people, and the survivors who are still alive. For example, young people who visit Poland and the death camps are encouraged to come to the Centre to debrief and meet survivors. They learn from survivors how they have made lives for themselves and how they have contributed to society. Survivors can pass on a positive legacy to young people including pictures of cultural life before the Holocaust began, as well as transmitting details of their suffering and that of their murdered families. We work with rabbis to influence their communities to see links between the Holocaust and the Haggadah and to emphasise the similarity between these stories of slavery and liberation. Bar and bat mitzvah students could be encouraged to study the Holocaust as part of their education. Yom Hashoah needs to be made relevant to young people so that it does not stop when survivors are no longer alive. Our work is not finished as long as survivors fear that their legacy will die with them. All of us who work with survivors are now witnesses in our own right and carry the responsibility that has been passed on to us. My speaking to you today and passing on what I have learned from survivors is also part of their legacy. Let’s ensure that this conference is used to strengthen our resolve to make the end of life for survivors positive, peaceful and a new beginning.